Are you taking on a DIY project? Are you taking on a DIY project, or cleaning out the attic? How about finally cutting down those over grown trees? KeyWaste have the perfect solution. 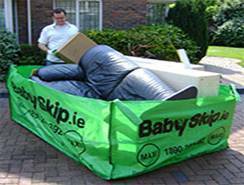 Our BabySkip skip bags are ideal for disposing of household and garden waste. 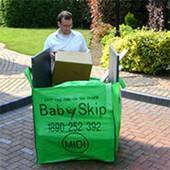 With prices starting from €69.00 and with three different sizes to choose from Babyskip bags offer a hassle free, cost effective alternative to the traditional steel skips. Simply buy the bag in your local hardware store, fill it at your own convenience and call our Babyskip hotline on 1890-252-392 to arrange collection. Once you pay for the collection of the bag, it will be lifted for you within five working days and we will not require you to be at the house! Our experienced drivers will collect your bag as soon as they pass through your area. All BabySkips are sold in an easy-to-carry plastic bag, measuring 50 x 50 x 5 (cm), perfect for easy storage until your next clear-out and all prices include VAT. 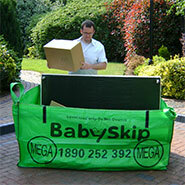 Buy the BabySkip bag from your local stockist, (garden centre, homestore, DIY store or building supplier). Call 1890 252 392 for collection. Gives you full control of your waste disposal. Buy it and fill it when you want to! Collection within 5 working days from booking it in. Convenience! No need to wait for our drivers as payment is taken over the phone. The Maxi can hold a standard three-piece suite!